This KG Bodyworks steering wheel has a 11 3/4" diameter and is wrapped completely in suede. It has a black anodized center aluminium piece holding it all together. This wheel is designed to be used with cadet / rookie karts. This KG Bodyworks steering wheel is a customized flat top wheel with a Margay Racing logo embroidered on the top. It has red suede on the top of the wheel, black suede on the bottom, and extra sections in the middle designed to give your hands move overall grip. This wheel has a 13" diameter and is designed for adult karts. This piece is to be used with the KG Bodyworks Daytona 330 series steering wheel, and is designed to be able to mount a Mychron or KG gauge. This KG Bodyworks steering wheel is a customized flat top wheel with a Margay Racing logo embroidered on the top. It has red suede on the top of the wheel, black suede on the bottom, and extra sections in the middle designed to give your hands move overall grip. This wheel has a 10" diameter and is designed for rookie/cadet karts. This bracket is designed for use on the Ignite or Margay branded Ignite King 330mm steering wheel. Bolts and hardware are not included. 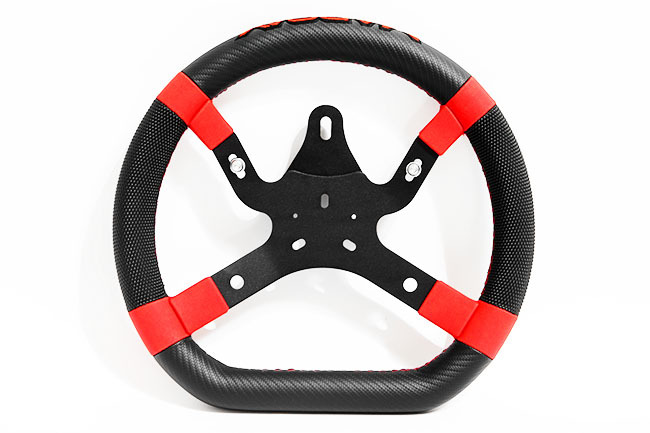 The KG M5 Steering Wheel Newest wheel in the Margay Ignite lineup. Dominate the competition with comfort, confidence, and great looks. This KG Bodyworks steering wheel is a customized flat top wheel with an Ignite Racing logo embroidered on the top. It has black suede on the top of the wheel, black suede on the bottom, and extra sections in the middle designed to give your hands move overall grip. This wheel has a 320mm diameter and is designed for adult karts.